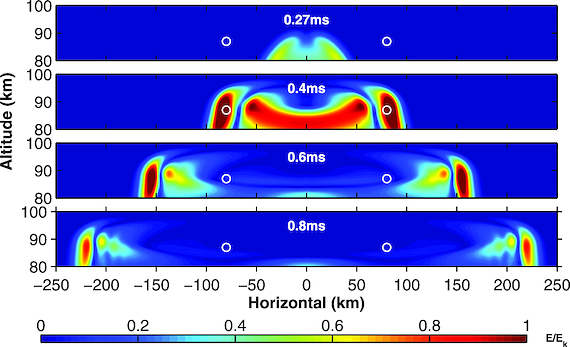 Spatiotemporal evolution of the electric field generated by a vertically oriented CG lightning with a peak current of 280 kA. In the cylindrical simulation domain, the altitudinal range (z) is between 80 and 100 km, while the horizontal range (r) is between 250 to 250 km. The strength of the electric field is in units of the conventional breakdown electric field Ek. 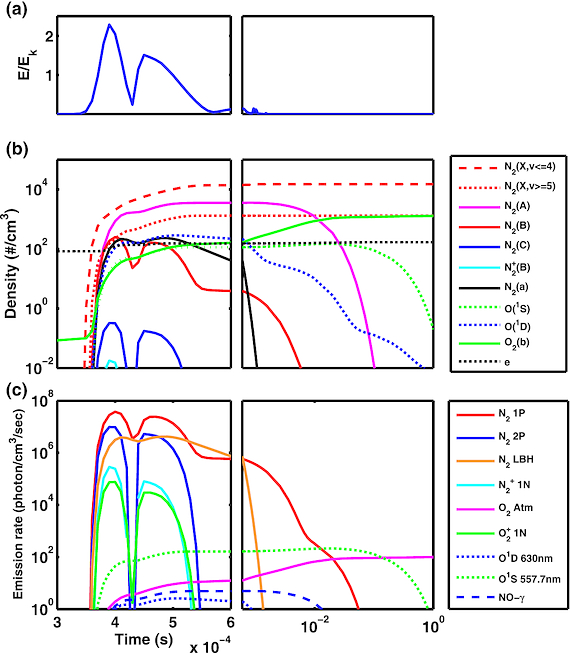 The open circles denote the points at r = 80 km and z = 87 km where the temporal evolutions of the chemical species and the associated chemiluminescent emissions are demonstrated in 圖2b and 圖2c, respectively. 圖2、(a) The lightning-generated electric field, (b) the temporal evolution of chemical species and (c) the temporal evolution of associated chemiluminescent emissions in elves at r = 80 km and z = 87 km (marked by open circles in 圖1).